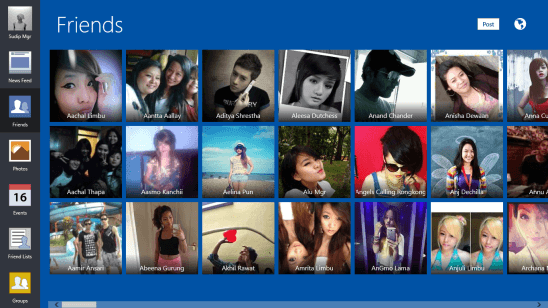 Vibe is a free Facebook client app, specially designed for your Windows 8 system. Though it’s not an official client app, but this doesn’t stops Vibe from being a well-made Facebook client app. 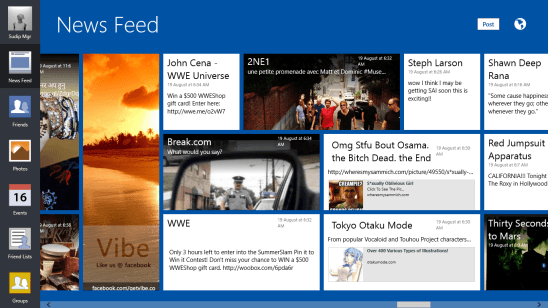 This free Windows 8 app shows you all the latest news feeds from your Facebook account. Along with that you can get connected with your Facebook friends, check out photos, posts, videos, upcoming events, know what your friends are up to by viewing their wall, view the latest happening in the groups which you have joined on Facebook, view notifications, and do lot more! That means you can do almost everything that you usually do with Facebook on web browser, but in a quite different, still a fine looking user interface. This is a great app for all Facebook junkies who want to stay updated with what’s cooking with their friends on Facebook. 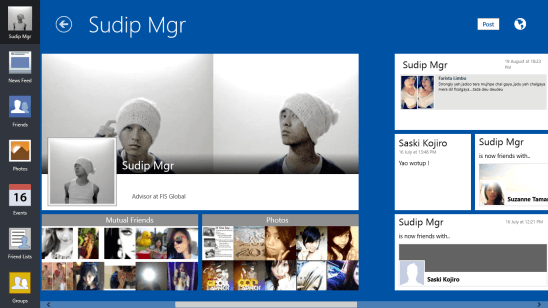 You can get this free Facebook Client App for Windows 8 under the Social Category in Windows Store. Like said before, the main purpose of this Facebook client app is to show you all the latest news feeds from your Facebook account. That is, it shows all up-to-the-minute posts from your Facebook friends account, groups, and the pages you liked. The post can be anything; a simple plain text, profile picture change, photo uploads, video uploads, etc. Other than that, this free app also lets you view your friend list, from where you can browse for a particular friend and then view his wall. The way this Facebook client app shows your friend list is quite interesting. In place of getting a boring list, you’ll see big thumbnail-sized images of your friends, arranged in tiles. 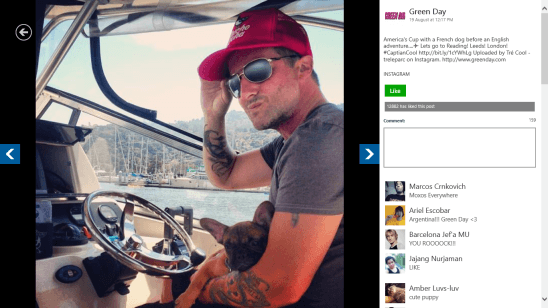 Besides that, you can view the photos in which your friends have tagged you, and the photos that you have uploaded. You can also view your wall and make a post, view the upcoming events like birthdays, party at friends’ house etc., view the walls of the groups that you have joined on Facebook, and view notifications. The app also allows you to chat with your friends but in order to do that, you will have to login again (with your Facebook credentials) within the app itself. The login process just mentioned, is different from the login that you do at the starting point, when you open the app. Obviously the app requires you to login with Facebook credentials at the start, so that it will show you the latest feeds; but besides that, in order to make a comment, view the textual posts, chat, etc., you will have to login to Facebook again, and you can do that by clicking on those posts which are made by the apps which you have subscribed on Facebook, such as: Horoscope app, cookies app, a game app, etc. ( that is, anything that requires your permission). This is something very unusual and looks a bit weird. But this is how the chat process works in Vibe. The app has a great design, and navigating between screens is easy. It does great in achieving it’s primary goal which is to keep you updated with all the latest Facebook feeds. The app refreshes at regular interval, or if you want to refresh it manually, then simply click on any of the button present at the ribbon at the far left side of screen, and then click on News Feeds button. Other than News Feeds button, this ribbon also consists of buttons naming Friends, Photos, Events, Friend List, and Groups. All the feeds gets beautifully laid out at the center. Clicking on any feed opens it in a full screen mode, with the cover photo as the background image. 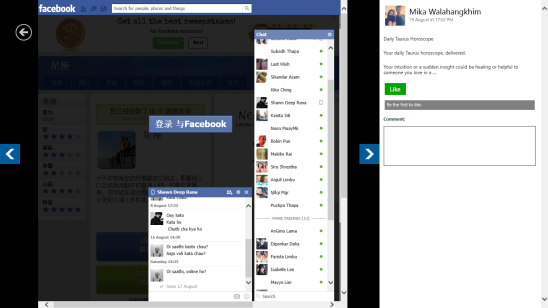 Good Facebook client app for Windows 8. Shows all latest Facebook feeds in an image rich environment. Let users do everything that they usually do with Facebook on web browser. As a Facebook client app, Vibe is a good option to opt for. You’ll enjoy viewing feeds in a beautifully laid out interface. Viewing post in full screen mode adds more to the pleasant appearance of the app. Though there are some issues, like it crashed a few times in my system, no Search Charm supported, and also the live tiles feature would have made the app more usable; still it’s a good app to try your hands on. And above all it doesn’t cost a penny. So try out now and do let us know how much you liked it.